Lotus of Siam - Las Vegas -The Best Thai in America? Lotus of Siam is the restaurant Jonathan Gold of Gourmet magazine called the best Thai restaurant in North America. I hope it's not. What's all the fuss about? From our experience it just wasn't that great. 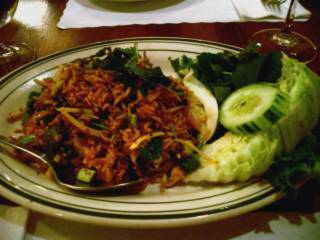 I haven't eaten a massive amount of Thai food Stateside, but I've regularly tasted as good or even better in London. Maybe this stuff is more authentic and I am ignorant? Maybe we ordered the wrong things? I don't know, but after rave reviews I'd heard on Chowhound's Southwest Boards. I was expecting it to blow me away. I could take it or leave the Lotus of Siam. I'd Probably leave it next time. nam kao tod The crispy rice salad with sour sausage. The pleasant sausage looks and tastes something like a pickled ham. The dish was offered on a scale of 1 to 10 in terms of spiciness. We chose 4. I've got to wonder about the people who choose 10. Do they live to tell the tale? Crispy rice was a little on the chewy side. Maybe it wasn't at its freshest. 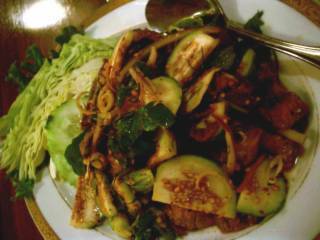 A rare beef salad with Thai aubergine. I've only had this kind of eggplant cooked before. Raw it's just a bit crunchy, healthy and boring. It over dominated the dish. 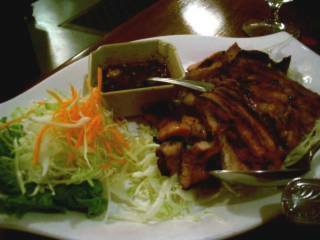 The meat was tender, but just a little too much on the fatty side to enjoy as a cold dish. A fairly plain pork dish, chosen by the unadventurous Fred. Slightly overcooked meat. It didn't convert him to Thai food. 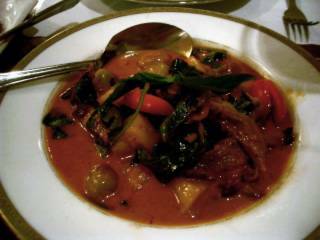 A Duck and pineapple curry. Fairly sweet, tasty, grapes almost the size of kumquats. Pleasant. Certainly not life changing. 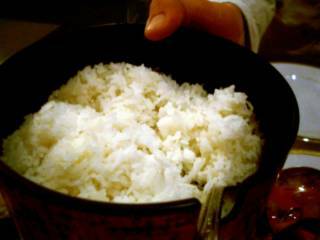 Rice include with each main dish. This restaurant is cheap. Dinner for two including wine and tip was only just over $50. You might need to figure a taxi ride into the calculation. For us, a journey to and from The Palms was about $15 each way. Wow! Just pick any well-regarded SF Thai place and it should be able to do better than that! I got given a Thai cooking class for my birthday just over a year ago - really worthwhile - food I couldn't cook before - and a lot of fun. It was through HomeChef - there's one in SF in the Laurel Village shopping center off California way out West. The one I went to was in Walnut Creek now I live in the East Bay. I had no idea you are in the East Bay! I have you in the wrong spot on my blog roll. Unfortunately Fred doesn't care for Thai though I like it so I am not sure about me taking cooking classes. I think French cooking courses would serve me better. Do you have a fave SF Thai restaurant? I am getting so jealous now that I am hearing of so many other San Franciscan's have had such great meals at LOS when mine was so diappointing. Really it was, the sausage thing was OK but the crispy rice wasn't really crispy. It tasted a bit stale and chewy. If anyone out there knows of a great Thai place in SF, please let all us San Franciscans know, especially if it is more authentic and less Amercanized. From what I can gander, there are a lot of people who would be overjoyed to find a great Thai place in the Bay area. Maybe you just didn't choose the right dishes??? Every one I and my friend raised in Bangkok have eaten was amazing! I've eaten there on multiple occasions. This is one of my must-visit's on any trip to Vegas. And in case you're wondering, I'm very well travelled and very well versed in cuisine. I highly recommend this restaurant!!! anon- i totally do believe you and i also believe you are probably right - we had the wrong dishes. It is a shame the restaurant has such a large menu so that customers make the mistake of choosing the wrong thing. I wonder why they don't just put the great stuff on their menu to help guide inexperienced people like me towards their stellar dishes. good point anon - i rarely take pictures anymore. only if i am on vacation. I saw this post in your archive link and had to read it. I had almost the exact same reaction after eating at Lotus with my mom a few weeks ago. Last week, we went back there with two of her friends who happen to be Thai. We let them do the ordering, and -- even though most dishes were no more than "medium" heat level, in deference to Mom -- the flavors were head and shoulders better. Perhaps is was a case of diminished expectations? Or of having a broader selection? Or maybe our server told the kitchen "pssst! this one is for THAI PEOPLE. Make it GOOD!" Both of my mom's freiends said it was the best the food they'd had in ages, definitely the equal of any in Vegas. P.S. Anita, i believe they treat all their customers the same, I'm white and I have no problem getting the same meal as everyone else does. So think before you let out a racist remark like that. It looks like healthy food.